Illuminate by Aimee Agresti. A Guilded Wings Novel. Review: Imagine having the choice to live a much longer life but on only if you sell your soul. Haven Terra and two other friends are on an internship at Lexington Hotel. Where they are having the time of their lives until…. Haven and her friend Lance uncover some horrid news. They learn that they are being hunted by the Outfit. The Outfit is the group workers at Lexington that have given up their souls and are trying to get Haven, Lance, and Dante to sell their souls. Soon the members of their high school are also being put into danger, and they must not only save their own lives, but they must also save their classmates lives as well. Illuminate by Aimee Agresti is an exciting read. It is full of action and adventure. I enjoyed the novel because it kept me at the edge of my seat the entire time, and it will also surely keep you at the edge of your seat too. Illuminate has unexpected twists and turns which is one reason why I enjoyed reading it so much. Haven Terra is a very realistic character because she is one of the classmates that is quiet and keeps to herself. I also enjoyed how the author, Aimee Agresti, incorporated the history of Chicago into the story which is where the story takes place. 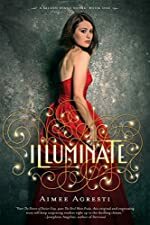 Illuminate is definitely a one of a kind excellent. It is truly a fun-filled book to read and I enjoyed it so much. I rate Illuminate ten out of ten. I give it a perfect score because to me a great book has to be unexpected and Illuminate fits the bill. Towards the beginning of the story Haven thinks, "Get me out of this horrid high school society and into Chicago society." This shows that she is excited to leave school for her internship at the Lexington Hotel. But towards the end, she feels completely opposite. I also enjoyed reading along as character Haven Terra transforms. I enjoyed that Haven and her friend are realistic and all grow and developed into better friends throughout the entire scenario. Overall, Illuminate is a fun book in which everything fits together like a puzzle, and it is amazing. Review written by Mia (6th grade student). We would like to thank Houghton Mifflin Harcourt for providing a copy of Illuminate for this review. Have you read Illuminate? How would you rate it?